The holiday season is upon us. Wonderful times of family gatherings, traditions and special homeschool learning. This can also be a stressful time since we are running around town to all sorts of activities – plays, parties, productions. To remedy the stress, each year I like to plan some simple yet educational holiday learning opportunities for our homeschool. I like things that I can tuck in my bag and carry with us in the homeschool bus as we are out and about. 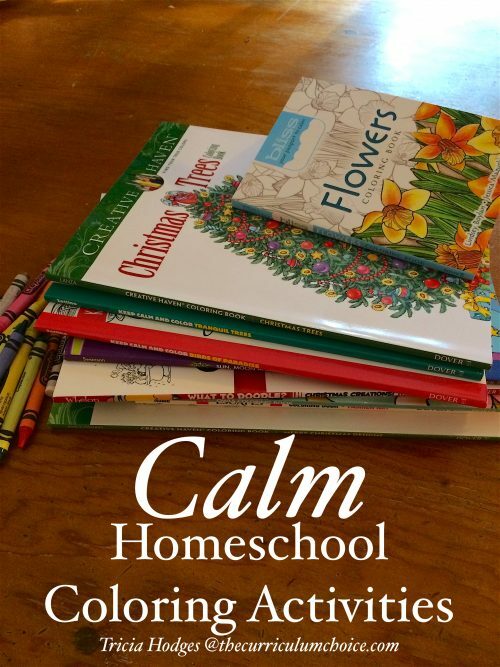 Dover Publications has many calm homeschool coloring activities that are not only great for learning but frugal and portable! ~Don’t miss the discount code plus the giveaway at the end!! 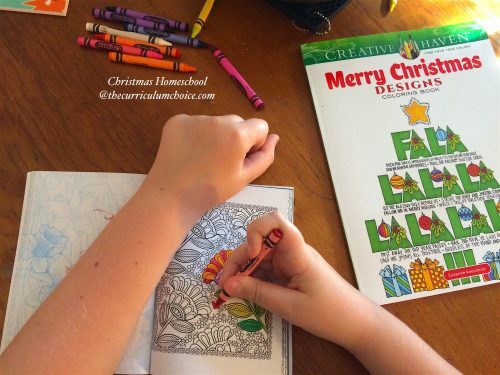 We received these calm homeschool coloring activities from Dover Publications in exchange for an honest review. All opinions are our own and we are so excited about the books for all our ages! Please see our disclosure policy. Do you homeschool during the holidays? Often we do a form of Christmas school. We get the basics done and then build in learning around family traditions. We enjoy a read aloud each evening when Dad is home. This year we are adding in learning about the different types of Christmas trees with Dover Publications. How much fun is that? 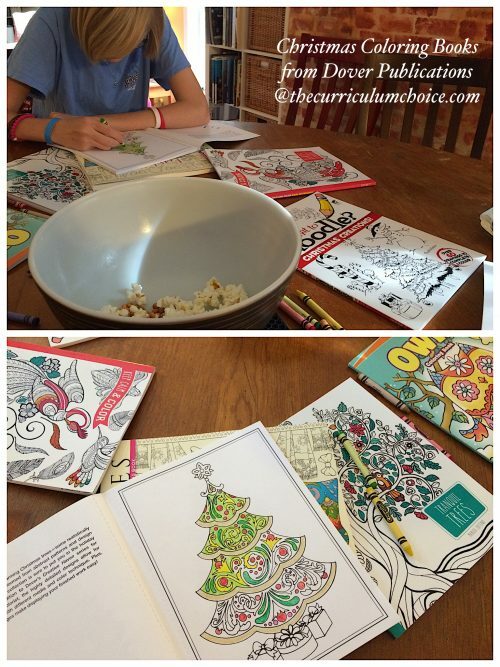 The Merry Christmas designs coloring book, pictured to the right, builds a picture out of pictures! My favorite is the bubble lights page. My daughter is coloring a page from BLISS Flowers Coloring Book: Your Passport to Calm. The pages are just beautiful! Each afternoon we all spend some quiet time away from each other. This serves several purposes. First of all, since we are all together every day of the week – we just need some quiet thinking time to ourselves. Also, having a designated quiet time builds in independent learning. A bonus is that after a busy day around the town, we can come in and enjoy some calming coloring. 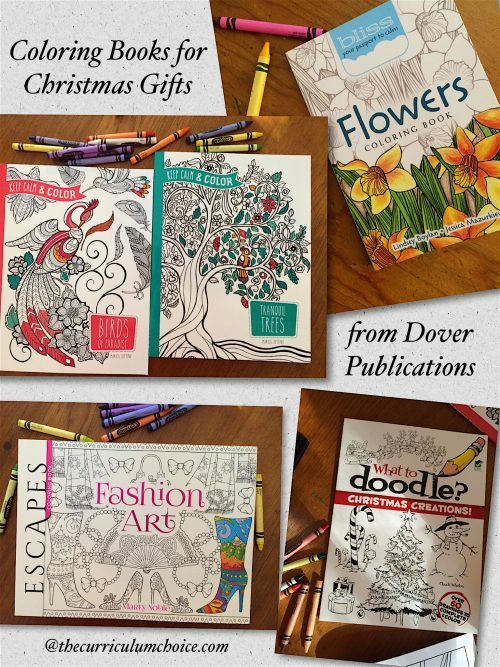 Dover Publications has something for each member of the family. When I browse the Dover Publications website, I can always find something that complements our homeschool studies. This time of year, I can find gifts for all of those I know that love to read – and color! Books on birds and flowers for nature study. Fashion art for your fashion designer. The What to Doodle? series to encourage your budding artist. I also have my eye on the Creative Haven WinterScapes (love all the birds!) Plus there are many more Christmas selections to choose from. 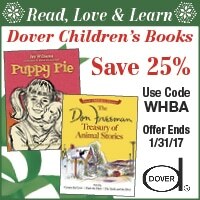 With Dover Publications you can get 25% off by using code WHBA at checkout and stock up too! Simply use the special code for The Curriculum Choice readers before January 31, 2017. Plus you can use crayons, colored pencils and/or markers you have on hand. No special supplies needed. The Giveaway – Family Coloring Pack worth $75 for 75 years! Now this is amazing. It is Dover Publications’ 75th anniversary! 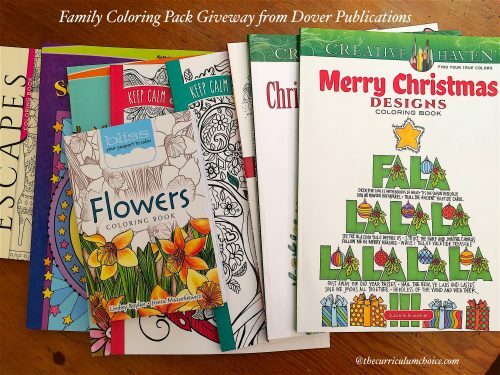 In celebration, they are giving away a Family Coloring Pack worth $75! All is calm… all is bright! I love all these new coloring books I’m seeing at every store! My kids might not be big on coloring but I sure am! Thank you for the chance to win these great resourses!